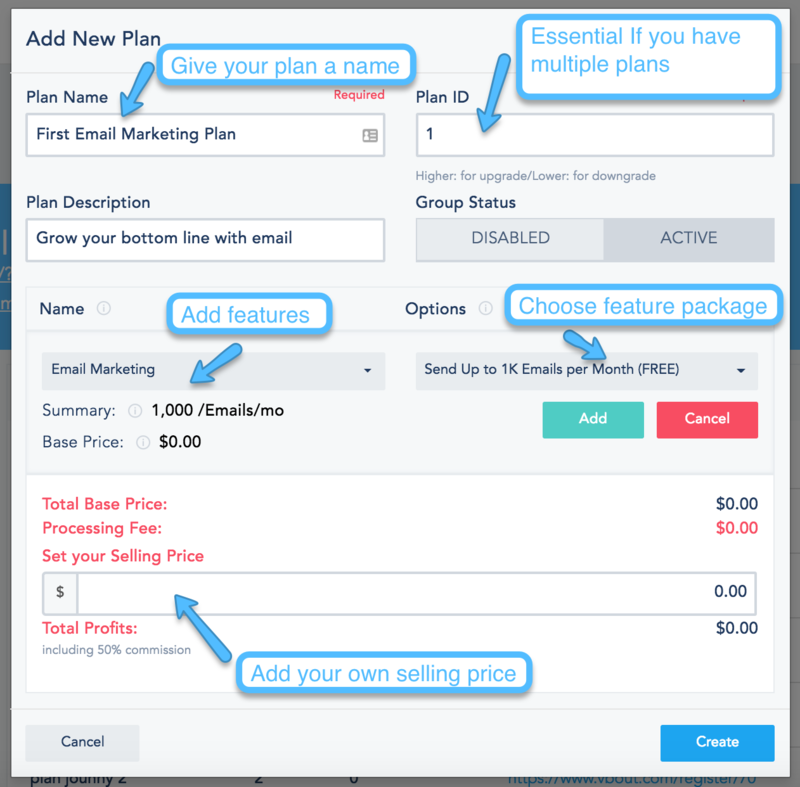 The custom plans feature will allow you to create a-la-carte marketing plans, for your customers. This means you can create a plan that includes Email Marketing and call it “Email Frenzy Gold”. To add a new custom plan, you can click on My Custom Plans from the left partnership side menu, then click on Add Plan. You will need to give your new plan a name, a description and an ID to specify the orders of the plans for your client’s upgrade/downgrade process. Next, you must add a new feature to your plan by clicking on the plus sign. On the drop, you can choose the VBOUT product you wish to offer then choose from the different plan limits and pricing options offered exclusively from this portal. (for example you can choose the Email Marketing product, with 10,000 emails/mo or 50,000 emails/mo…). Once you finish adding all the products and limits press Add to add the product into the plan. VBOUT will automatically display the total base price for the features you picked minus your discount as a partner. You also have the ability to set your own price for your customers and upsell the plans as you see fit. Total Profits = Selling Price – 0.3*(Total Base Price) – Processing fees. Once you finish that, you will need to click on Create in the bottom right to actually create the plan. If you list your custom plans you will see that each one of them will have its own unique registration URL which will be used to sign up to this custom plan. Your customers can use the custom plan URL above to sign up to VBOUT. Signups will be attributed to your partners account and be shown under the Customers section of your portal.